Gold Multi Circle Wall Mirror 61cm x 103cm - Large wall mirror for modern, contemporary home decors. Decorative design with elegant, luxe style gold frame. 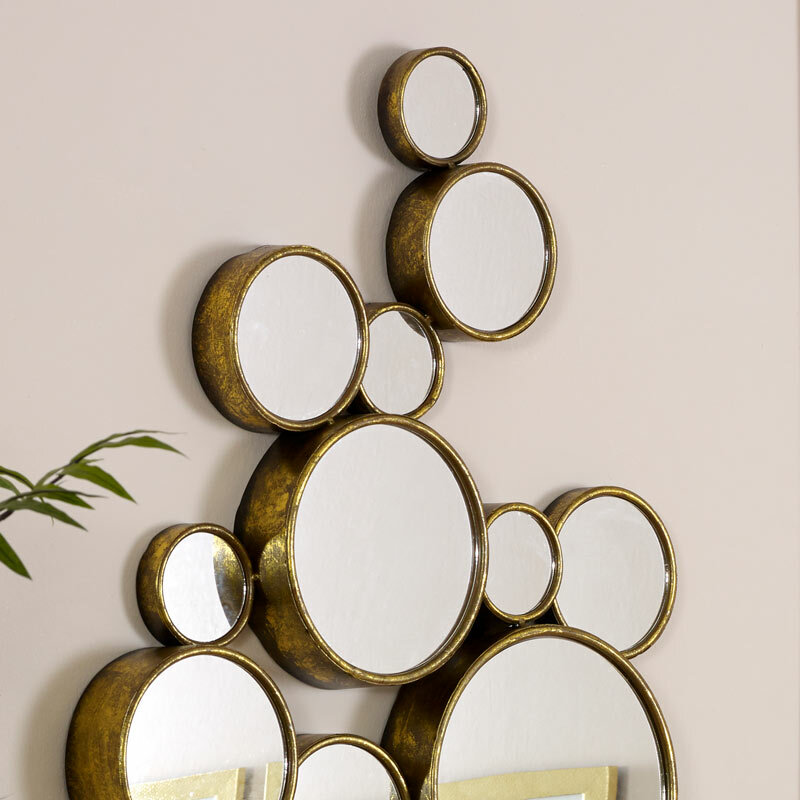 Luxurious and glam, gold multi circle wall mirror will make the perfect statement in the living room or hallway. MAde up of 15 circles with antique gold metal frames. Mirrors make the best home decor accessory and help to add that finishing touch and create a sense of light and space as well as adding a touch of drama and elegant style. Gold Multi Circle Wall Mirror 61cm x 103cm - Large wall mirror for modern, contemporary home decors. Decorative design with elegant, luxe style gold frame. 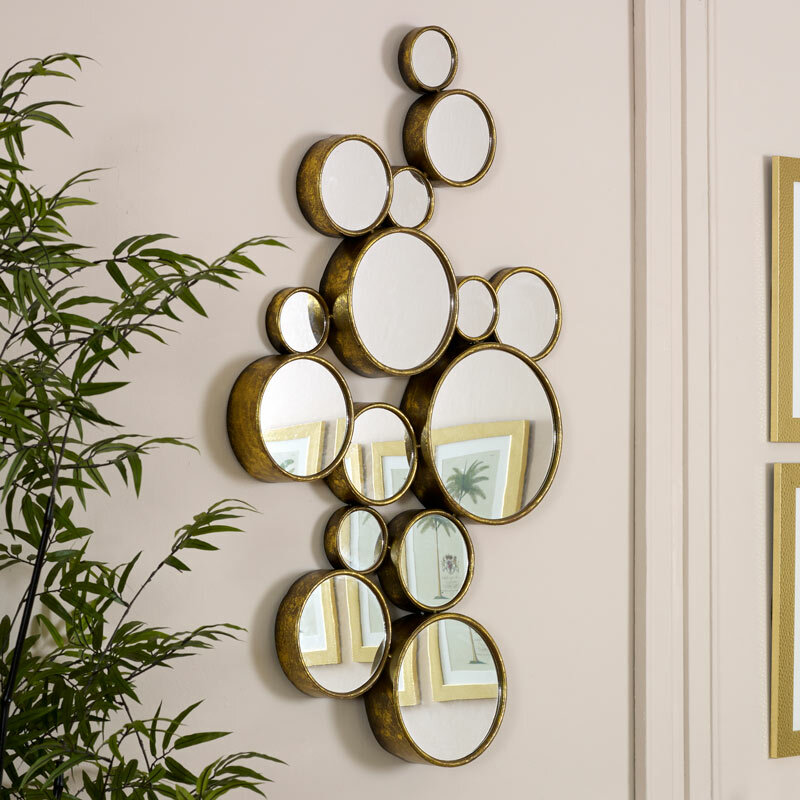 Luxurious and glam, gold multi circle wall mirror will make the perfect statement in the living room or hallway. MAde up of 15 circles with antique gold metal frames. Mirrors make the best home decor accessory and help to add that finishing touch and create a sense of light and space as well as adding a touch of drama and elegant style. Made with metal frame connecting the circular mirrors in an antique gold finish. Hooks on the back for wall mounting. Part of our ever expanding range of mirrors. We have a superb choice of wall, freestanding, tabletop, floor and leaner mirrors in a great range of colours, styles and finishes. Something to suit every home and decor style.